Look out! That mischievous shadow bat is attacking Cory the Guardian Water Turtle! Help Naida use her power to distract Furi the bat with the disc shooter on the small island, while Cory and Calypso the baby turtle try to escape. Oh no, Furi is shooting its evil chain at Cory to try to capture her! Get Calypso to safety on Cory's back, before you shoot more discs at Furi's boat. Can you protect the turtles and the magic Water diamond? Price is 44% below the initial Lego retail price, a € 12.00 discount! This comes down to 7.31 cent per brick. The Naida & the Water Turtle Ambush (41191) Lego set is available from the sites below. However, they do not offer delivery to your selected region. 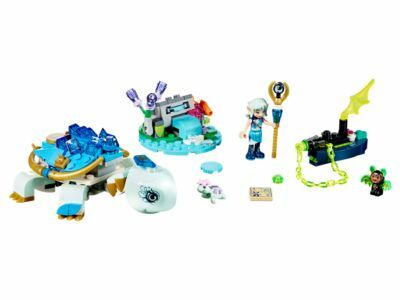 The Naida & the Water Turtle Ambush (41191) Lego set is no longer directly available from the sites below. However, 3rd party partners of these sites might still have the set available. Alternate description Help Naida defend the Guardian Water Turtle from the shadow bat!